Stromtrooper Forum : Suzuki V-Strom Motorcycle Forums > Popular Forums > DL1000 from 2002-2012 > Stator magnets & JB Weld - pictures? Agreed, the idea is to get something in between the magnets so they can't change position. They're not going to fall off; the failures are from sliding around. There's no need to pry them off, and even if a magnet is already loose, there's not much reason to try and get JB Weld underneath it -- you don't want to build up so much that it can contact the stator. One thing to note is that JB Weld contains iron particles, and in my attempts to do this, it wanted to creep along the lines of magnetic force before it hardened -- if I used too much, I ended up with a hollow "bridge" between the magnets. A better approach is to use a little at a time and build it up more gradually. A nonmagnetic epoxy putty that uses a different filler metal would probably be easier to use. Titanium Putty is crazy expensive, though. Last edited by bwringer; 02-05-2018 at 05:04 PM. OK, I JB'ed mine but they were all solid and in position still. Gotta look into a Buddy's '06 1000 he just bought and see how magnet positioning is and do as a preventative also. Appropriate Amount of JB Weld for Stator Magnets??? I'm at a loss here. My K3 Vee was charging down in the 11 volt range last year, so I opened it up and sure enough, the stator magnets had migrated. I cleaned them off and stuck them back in place in the correct polarities, and then added JB Weld between them. A month or two later, charging in the 11 volt range again. The JB Weld had all disappeared and the magnets had migrated again. This time I put more JB Weld on, as much as I was comfortable with, and pinned it back up. Well, whaddya know, it's charging low AGAIN. I don't want to completely fill the gaps between the magnets, as this seems like it'll drastically increase the weight of the flywheel, but I'm really confused as to how much is actually enough. 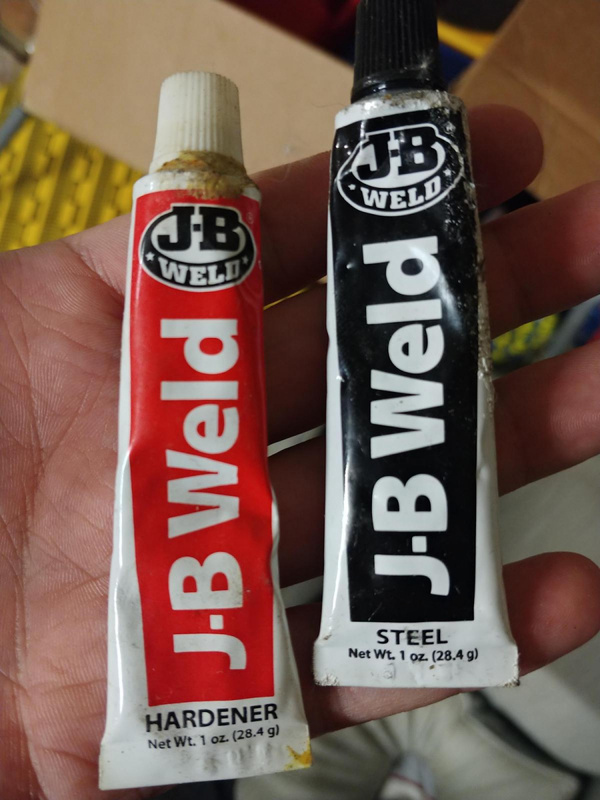 Does anyone have a picture of their successful JB Weld fix showing the amount of stuff they used? "Definitely do not sit on a DL1000. Big mistake. You'll end up buying one. Happened to me. True story." "Purchasing a V-Strom from a Harley dealer does have poetic justice. Almost like removing a talented child from a meth house." "I'm for moves that will help people get over the idea that it is ever okay to drink and drive." You shouldn't need much. When I did it, I pretty much filled the gaps, but that is really overkill. The magnets can't climb over the welding, so you only need to create a wedge between them. What kind of JB Weld did you use? There are different kinds, some more suitable to this application than others. Other than that, perhaps the surface was oil-contaminated and the weld did not stick. There are pictures of welded magnets in a thread someplace on this forum. Have a search. Sounds like you are using the quick set JB Weld. It won't hold up! You must use the standard 24 hour cure formula. Black lettering on white tube and red lettering on white tube. There is no need to fully fill the gap. Just put an equal amount in all gaps, or as close as you can. This should be a permanent fix. I have seen NO problems with JB Weld dissolving or flaking off on the stuff I have used it on. Nope, both times it was the standard two tube JB Weld. I had a theory that perhaps the first stuff I used was old, so I bought new stuff for the second application, and yet here I am. When I installed your basket, Terry, I pulled lots of chunks of it out of the oil strainer. And yeah- I thought that just enough to stop them creeping was enough, and then I made a full bridge between on round 2, but that didn't seem to work either. I'm worried if I completely fill the space that it will either not fill completely and unbalance the flywheel, or it will increase the weight significantly and be detrimental to the motor's character. Oh and the second time I heavily cleaned the inside of the flywheel with carb cleaner and degreaser and even scuffed up the gaps just a touch to help the weld grab on better. Try a final clean with acetone, some carb cleaners can leave a residue behind. I am at a loss on this. I have never seen any breakdown in the JB Weld. I was using it on the Super Tenere clutch baskets, a Final Drive Minder I used to sell, and of course on these magnets. Even if you didn't clean it well, the epoxy should not dissolve or disappear. The only thing that comes to mind is mixing it properly. Big B, aTuWitty and MAZ4ME like this. Check this thread, particularly #108, I post a pic of mine there (also sb visible in my album bike pics). I made a wedge about 5 mm wide in a U shape. I haven’t had my case off since then, but my voltage is consistently perfect. I also installed a SH847 and my rotor is stock, I’m at 14.8 volts running heated grips, led lights. Just sayin you can get past this! But a buddy had his jb weld fail in his Vee also so I’m curious to inspect mine (see @Wildoktor #140). His jb weld job vs mine (#108 vs #109). Mine is connected from left to right, no gap at all between the magnets. A hardened glob of jb weld is like rock, mix some up and for fun try to bite it in half. No way for magnets to crush it.